LONDON (Reuters) - Barclays announced a number of promotions in its investment bank's management on Friday as it continues a review of the division that contributes about half of group profit. The British lender said in a statement that it had appointed Eric Felder as head of markets, supervising the investment bank's global sales and trading businesses across all asset classes. Felder, who joined Barclays from now-defunct U.S. investment bank Lehman Brothers in 2008, was previously co-head of securities. In addition, Joe McGrath and Richard Taylor were named as co-heads of banking, responsible for the investment bank's global corporate finance and strategic advisory units. A former Goldman Sachs banker, McGrath was most recently a co-head of the global finance and risk solutions business. Taylor, who has in the past worked for Bank of America Merrill Lynch and HSBC , was head of investment banking in the Europe, Middle East and Africa region. All three report to Eric Bommensath and Tom King, the joint chief executives of corporate and investment banking at Barclays. Hitherto Bommensath had also been head of markets, while King was responsible for banking. Barclays Chief Executive Antony Jenkins has embarked on the third review of the investment bank in as many years in response to pressure to cut costs and improve returns. Analysts predict that this might lead to a cut in the division's size of up to 20 percent. This would equate to about 5,000 jobs being lost out of 26,000 and could strip out about 900 million pounds in annual costs. 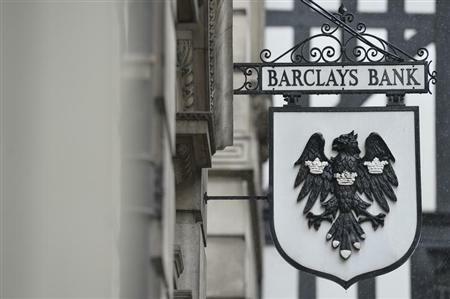 A fresh media report about the review sent Barclays shares up 3.6 percent to 246 pence by 0954 ET. The Sky News report cited a memo sent to staff by Jenkins, in which he said he wanted to set out a clear path to build a better Barclays that can deliver sustainable returns and growth. "If he's (Jenkins) being proactive about cutting jobs, I think that's a good thing," said Manoj Ladwa, head of trading at TJM Partners. The bank said it will present a strategic update on May 8. How can I buy an S&P 500 fund? Were Hedge Funds Right About Flocking Into Booz Allen Hamilton Holding Corporation (BAH) ? Can Your 401(k) Serve as Your Emergency Fund? Stocks are calm and volume has dried up — is this the 'calm before the storm'?